Medical Device Manufacturers must contend with a slew of different legislative and regulatory challenges, many of which can influence whether a product eventually makes it to market. Compliance issues are probably the most specific to this sector, as products, solutions, and technology often needs to comply with rigorous regulations that are outlined by notoriously stringent governing bodies, like the FDA. This means that Medical Device Manufacturers often have very specific needs when it comes to business systems. They need an integrated system that can unify their product development, supply chains, manufacturing processes and distribution networks. Oftentimes, the responsibility for such a difficult task falls on cloud ERP systems, many of which provide unique benefits that are highly relevant for this competitive industry. 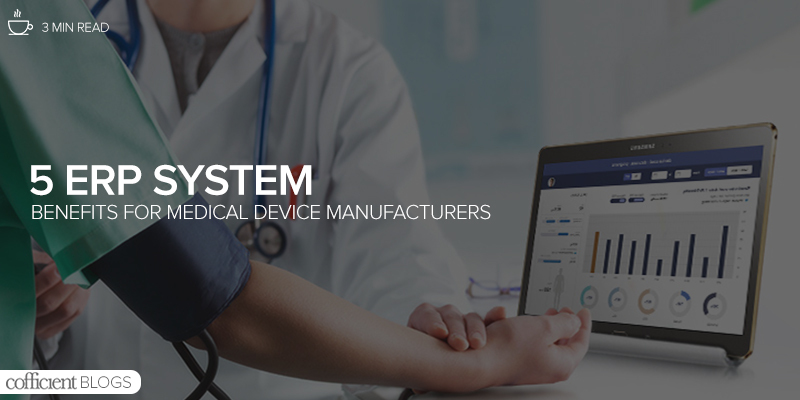 In this blog, we’ll outline 5 of the most important ERP System benefits for Medical Device Manufacturers. It is imperative that you keep up with sales requests and that you manage relevant manufacturing processes from the same interactive dashboard. In doing so, you’ll be able to maintain the right stock levels and liaise with any required suppliers or external parties so you can avoid fulfilment issues. This can facilitate a quick-fire deployment of your product across all relevant markets the minute you make it through an FDA trial, for example. Cloud ERP systems can process and store a complete history of all your compliance documents and protocols so that you can retrieve them whenever necessary. Many ERP solutions, for example, can store manufacturing specifications and certifications, along with any relevant signatures or supplier documentation. Some even include built in functionality that accommodates FDA approved record-keeping, which helps you organise your business operations around the necessary compliance regulations. Interdepartmental and enterprise-wide automation is complimented by a sophisticated CRM software that allows you to link the front and the back office. Put your customer and your target market at the heart of your business by implementing a refined sales and nurturing process, which is based on real data and not just outdated sales hunches. This allows you to maintain visibility over all the most important areas of your business, while maintaining regulatory control. Flexible manufacturing automation allows businesses to build their systems from the ground up. Manufacturing Execution Systems (MES), include a variety of useful functionality like Bills of Materials (BOMS), Manufacturing Specs, Manuals & Recipes, etc. The beauty of cloud ERP systems is that manual processes can be eliminated, and various information streams linked up, like contracts, billing, production schedules, partner management, and ingredient/supply data. This essentially removes the need for outdated manual processes and allows you to automate wherever possible. Not only that, but you’ll always have access to the most important regulatory documents whenever required. This helps make investigations and trials proceed smoothly. The products your business develops are of paramount importance to both the end users and the organisations you supply. Your software therefore needs to comply with the most stringent legal requirements and health considerations. Record keeping and traceability are two factors that are vital in the Medical Device Industry. While you may not be able to cut costs on the research, development, testing, and approval stages, you certainly can make up for these expenses with a unified and efficient business management system. Record keeping allows you to ensure the traceability of your materials, products, and suppliers, which will aid any funding applications or approval trials. Cloud ERP systems, like NetSuite or SAP Business ByDesign, allow you to keep a scrupulous note of all the most important information and documents so that you can retrieve them when you need them. We’ve got plenty more information about ERP software that is particularly useful for Medical Device Manufacturers.